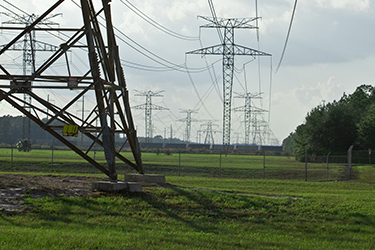 The U.S. electric transmission grid is a complex network of more than 200,000 miles of high-voltage transmission line. Visually, the grid resembles a high-powered spider web spanning the country, delivering electricity from power plants to homes and businesses. The electric transmission system in Peninsular Florida currently has approximately 16,000 miles of transmission line rated from 69,000 volts up to 500,000 volts. Of that, Seminole Electric owns and maintains more than 350 miles of transmission line. Seminole transmission facilities are interconnected with other transmission providers (TPs) and much of SECI’s Member load is served through the transmission of other TPs that deliver power to Seminole Members. Traveling at nearly the speed of light, electricity flows through high voltage transmission lines until reaching “step-down transformers,” where the voltage is reduced, usually down to 69,000 volts or less. After the electricity is further reduced, it is transferred to smaller distribution lines that travel safely from Member electric cooperatives to homes and businesses. Lastly, voltage is decreased for residential use, typically 110 volts or 220 volts. Vegetation management, commonly referred to as right-of-way maintenance, is essential in providing safe and reliable electric service. Seminole Electric, through its transmission vegetation management plan and energy delivery team, work hard to ensure that rights of way are cleared regularly of trees and brush to help reduce potential outages and hazards. Trees and branches growing in or near power lines can cause interruptions in service. Uncontrolled brush can impede access to utility structures. Managing vegetation along Seminole’s transmission lines is an ongoing responsibility. Regular vegetation maintenance increases electric reliability and decreases service interruptions.